Hundreds of Greek anarchist youths were confronted on Friday night by police in riot gear in downtown Athens after a wave of unrest this week, local media reported. Around 200 hooded protesters threw Molotov cocktails and rocks at police in Kaningos square. Officers responded with teargas and stun grenades but were forced to retreat, the Proto Thema newspaper said. 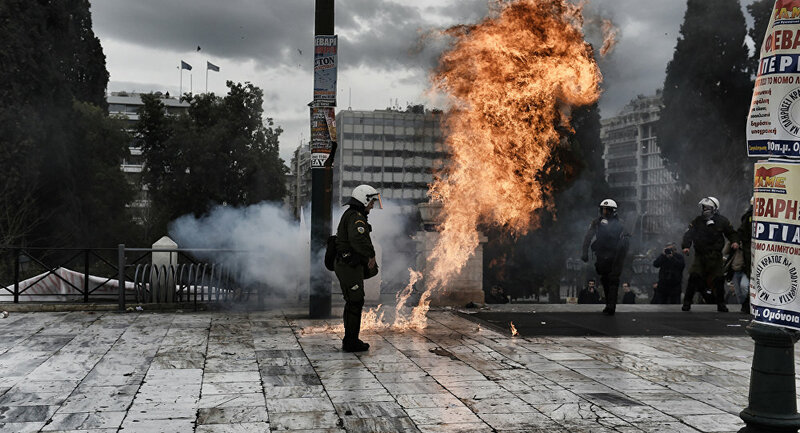 Athens residents have been calling on authorities to rein in the homegrown anarchist movement for days. A thousand of football fans have reportedly contributed to the violence. Earlier on Friday, rowdy fans smashed the Athens office of the Thessaloniki-based football club PAOK ahead of a game with the local AEK. A day before that, members of the Rubicon anarchist group broke into the Oxfam office after accusing the nonprofit of ties to pedophiles.